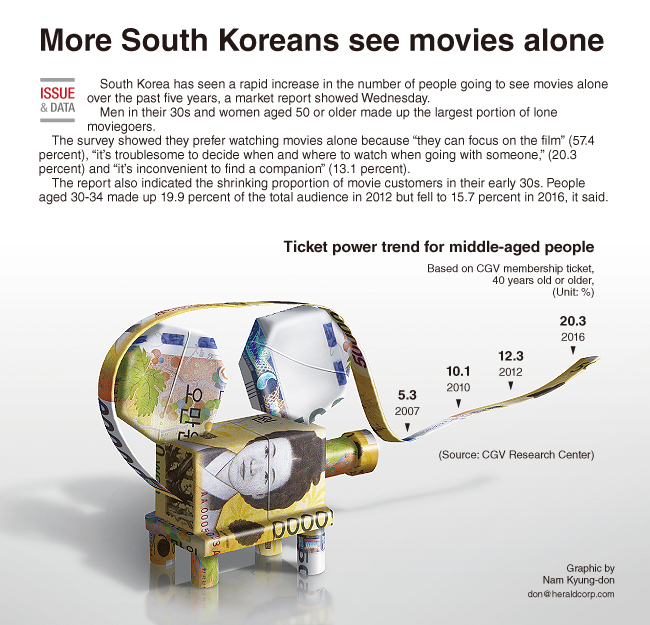 South Korea has seen a rapid increase in the number of people going to see a movie alone over the past five years, a market report showed Wednesday. Men in their 30s and women aged 50 or older made up the largest portion of lone moviegoers. The survey showed they prefer watching movies alone because “they can focus on the film” (57.4 percent), “it‘s troublesome to decide when and where to watch when there is a companion,” (20.3 percent) and “it’s annoying to find a companion” (13.1 percent). The report also indicated the shrinking proportion of movie customers in their early 30s. People aged 30-34 made up 19.9 percent of the total audience in 2012 but fell to 15.7 percent in 2016, it said.